Here’s a date night cheese board idea for two… or for one, because I’m not judging. 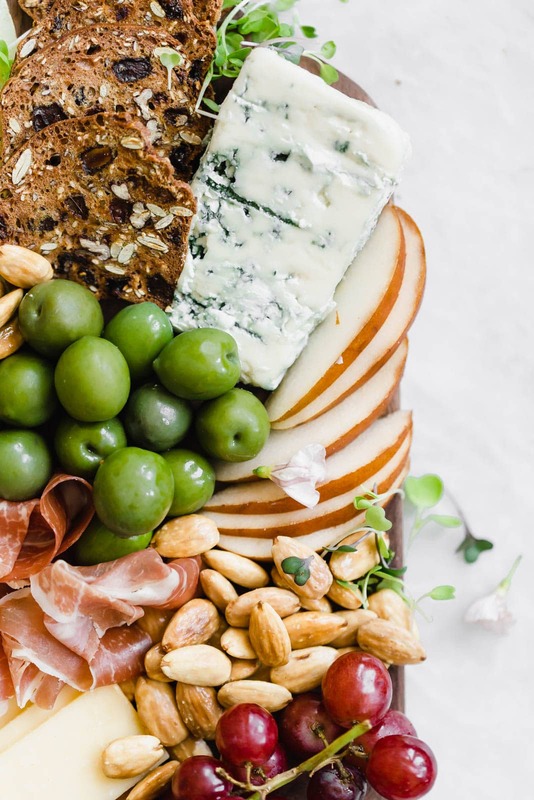 But actually, this cheese board is an instant way to class up your date night in. So cozy up to your bf, gf, or bff and get a cheese-ing! I’m the type of person who really enjoys going out, and also really enjoys staying in. And for those nights that I stay in, I love making it feel just as special as if I had gone out. I keep things cozy, but also jazz them up a bit. Homemade cheese boards embody this duality of homey-ness and excitement. They are so classy, and with their multiple ingredients offer endless flavor combinations. And yet, you can make a world class cheese board in about 10 minutes; minimal effort required. 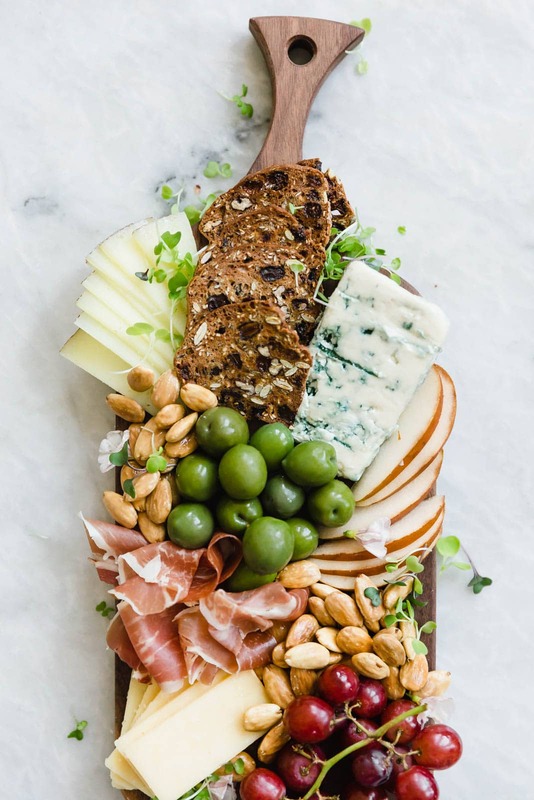 This Date Night Cheese Board for Two has many stars — a funky blue cheese wedge, umami-y castelvetrano olives, and prosciutto de Parma. But this biggest stars, in my opinion, are the homemade “Marcona” almonds. 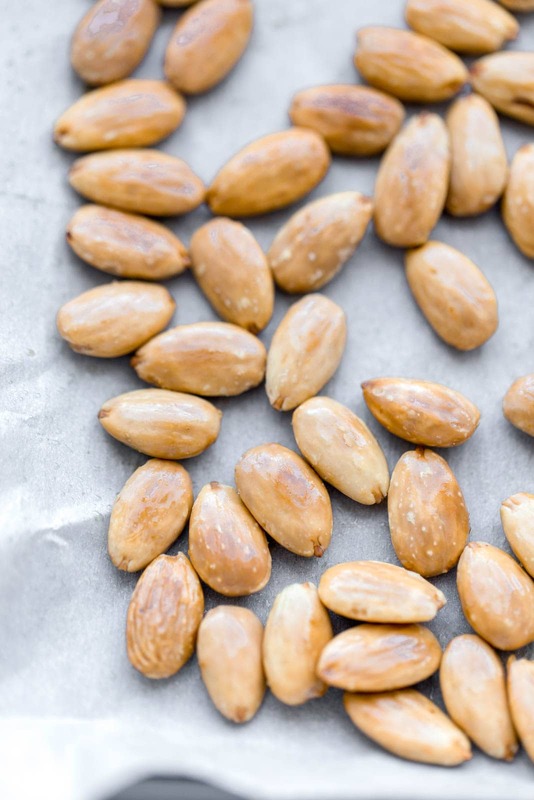 Yes, people, you can make your own version of Marcona almonds at home. And it’s surprisingly easy. I started by blanching a cup of Blue Diamond Whole Natural Almonds, then popped off the skins (it’s weirdly therapeutic) and roasted them for 5 minutes. Et voilà. One of my girlfriends liked the almonds so much she literally asked me if she could pay me to make a huge batch. So yeah. They’re pretty awesome. 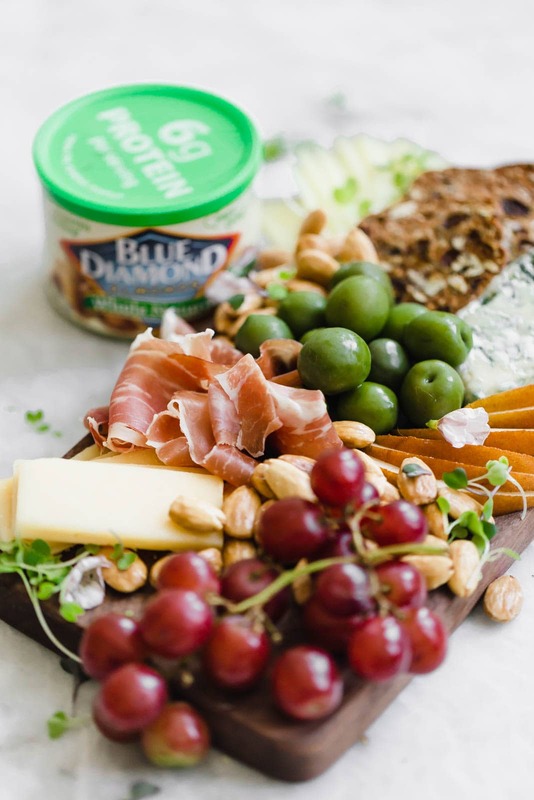 If you want to switch up the cheese board ideas I’ve listed in the recipe card below but aren’t sure where to start, I recommend hitting up the cheese counter at your local grocery store and asking for their opinion. I’m sure there are dozens of cheeses you’ve never thought to try that you and your partner will love! Preheat oven to 350°F. Line a small baking sheet with parchment paper. Set aside. Bring a small pot of water to a boil over high heat. Pour in half of the almonds and blanch for 30 seconds. Remove quickly with a slotted spoon and allow to cool slightly. Repeat with remaining almonds. Use your fingers to gently pop off the almond skin from each almond. Pat almonds with a paper towel to remove any excess moisture. Place almonds onto prepared baking sheet and drizzle with olive oil and salt. Spread out evenly, then bake for 5-7 minutes, turning halfway. Almonds are ready when they are lightly golden brown. Allow to cool slightly. Can be stored for up to 4 weeks. Place cheeses on cheeseboard first. Place grapes, crackers, and olives next. Last, fill in the empty gaps with almonds and prosciutto. Top with microgreens, if using. Serve! 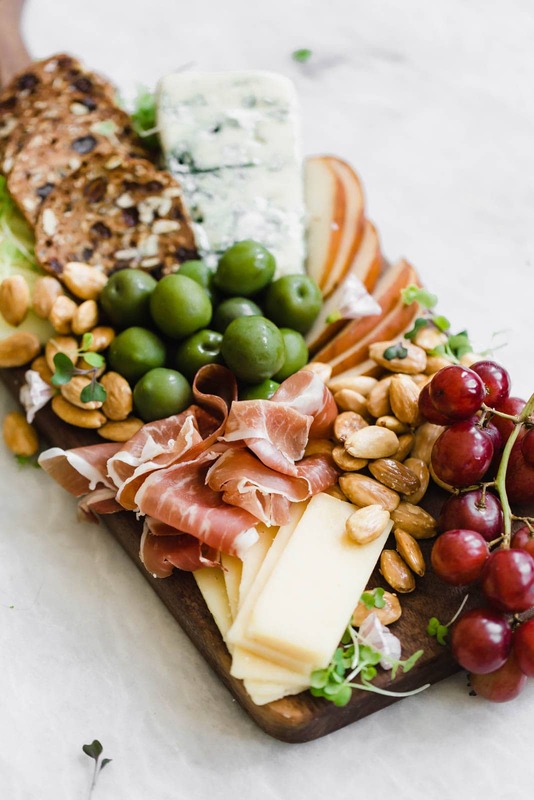 cheeseboards are a favorite weekend date night tradition in our house! i also had NO idea that you can DIY marcona almonds – total game changer. can’t wait to give it a try! It IS a game changer!! Seriously, they’re so delicious. Thanks Jess! what a beautiful cheeseboard and I’ll definitely have to try the almonds! I’m curious – what brand of crackers are on the board? they look delicious! Hi Lynda! I used raincoast crisps. They have a great selection! Sarahhh! The ‘words cheese board for 2’ lead me to believe you are my SOUL sister! Hells yes. PS those are the best olives in the world. AREN’T THEY THOUGH? Like, I don’t like olives, but I love these ones. I make Cheese boards almost every weekend just because it’s the weekend. ? I like your style, girlfriend. I’d like to repeat that these are marcona style almonds. marconas are from Spain and are a different type of almond — they even look different (rounder). Also taste a little different. You are correct! I specifically put the words “Marcona” in quotes to illustrate that they aren’t true Marcona almonds. But they’re darn close! Thank you! I have always wanted to learn how to make one of these – most recipes feed a crowd but thanks to you, I can use this recipe for my solo dinner on those hot summer days when I do not want to cook by adding more fruit to the platter. Darn spell check…Perfect lBD WORK FOR YOU! Hehehe. 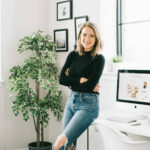 Oh your design skills would definitely come in handy in a full-blown date night shoot! I love everything about this cheese board. . I could literally eat this every day! love! 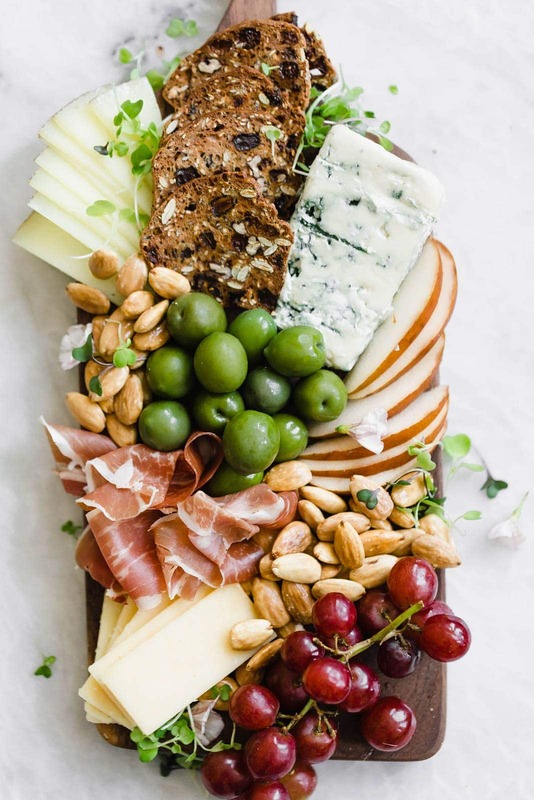 I love cheese boards and you absolutely killed it with this one – perfect! Those almonds sound divine!! And easy to boot. Your cheese board is very pretty. I’m like you… going out is fun, but sometimes it’s nice to indulge at home. Marcona almonds are the best! This is perfect for date night. Not too filling, beautiful presentation…. love it. Marcona almonds are my favorite! Beautiful board! This is stunning!!! My kinda board!! THis would be so easy to recreate for a picnic! Looks awesome! I could eat a cheese board any day, anywhere!! Love them! I know. Any day, every day! I just pinned this 5 minutes ago! seriously stunning – I could live on a good cheese board!